Perfect weekend for a Colette party! I need to be honest: I get pretty jealous of some of you guys. I read your blogs and see pictures of all the fun sewing/blogger meet ups that you go on and it makes me wish I was there! 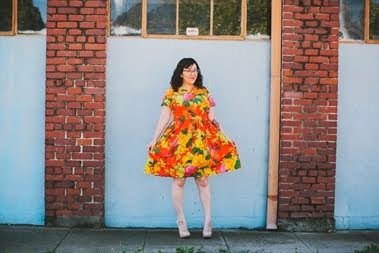 I don't know anyone that sews clothing in the San Luis Obispo area (and if you do, speak up so we can hang out), so when I found out that the Colette Patterns Fall 2012 Launch Party was going to be a few hours away in Oakland, I knew I had to go. My friend Qui and I talked for weeks about how excited we were for the party and decided to make a day of it. 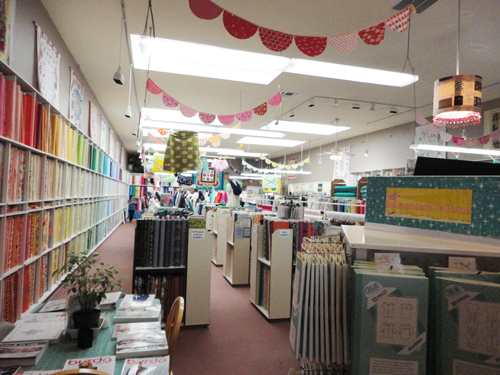 On Saturday morning I drove up to Santa Cruz to go to her house and from there we went to Hart's Fabric for a little shopping. We were probably in the store for about five minutes before I decided that I wanted everything. There is a good selection of garment fabrics, fun quilting cottons, BOOKS, and an impressive amount of sewing patterns from independent designers. It was love at first sight. 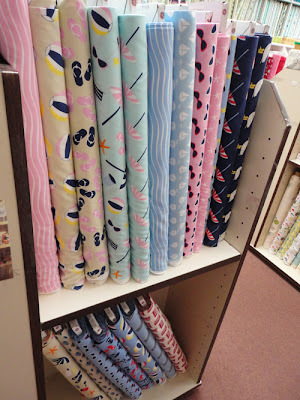 This quilting cotton is from the designer Dear Stella. I had never heard of the company, but I am now a fan. I want a quilt out of their fabric soooo bad! I bought this Jamie Christina pattern from Hart's. Our next stop was Oakland. Qui was sweet enough to drive (which was probably safer for the both of us haha) and we made it just in time for the pre-party meet up. 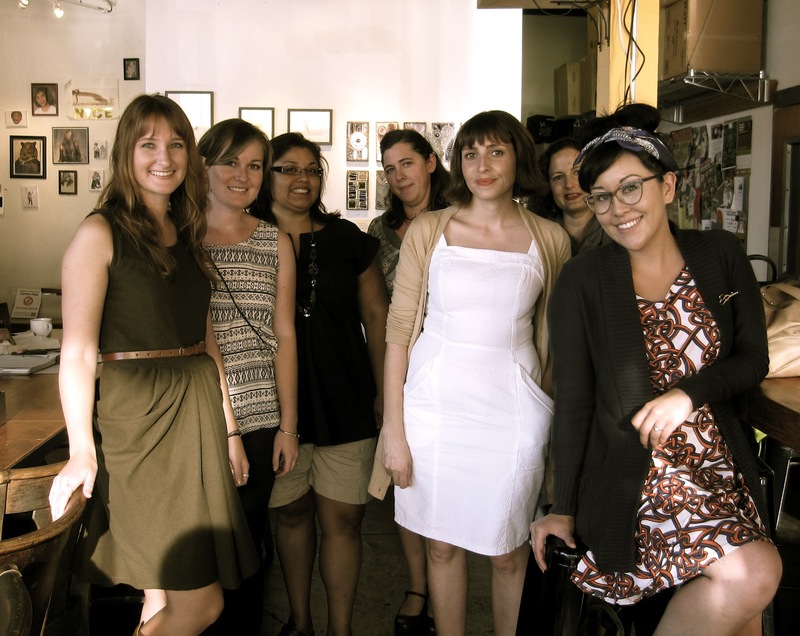 Between 15 and 20 awesome ladies showed up to hang out at Actual Cafe. Soup is my favorite. 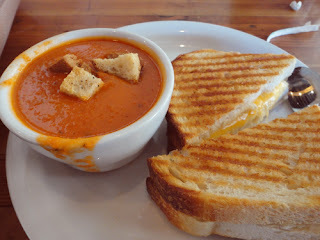 Actual Cafe makes a good tomato coconut with grilled cheese, yum! I invited Sarai and Ken to the meet up and I was sooo happy that they came! Based on what I could see on the world wide web, I knew Sarai to be so sweet, intelligent, and encouraging. When I met her in person she did not disappoint, she is truly one of the nicest people I have met. Both she and Ken were friendly and fun to be around. Sarai and I. Thanks for taking the photo, Qui! The meet up was a success and I got to talk about sewing with so many other ladies that share the same interest. One of first people I met was Meg, a girl with a bubbly personality in an amazing green dress. Meg is one of those people that you feel like you have known a lot longer than you have, she's great! When Michelle walked in the door I got super excited because I just featured her in the Macaron Parade and loved her dress! After chatting for a bit we realized that we were raised in the same town, Paso Robles, and knew some of the same people. Small world! Amy was another person that I was excited to talk to. 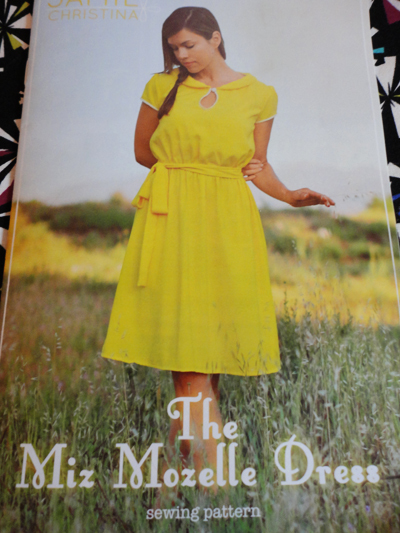 I have seen her beautiful garments from time to time on the Sew Weekly and her clothes are just as pretty in person. Her skirt was to die for! 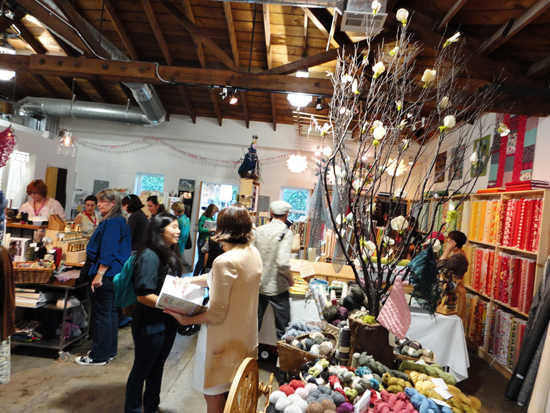 We all walked next door to the party spot, A Verb for Keeping Warm, a cute store with lots of yarn and fabric. 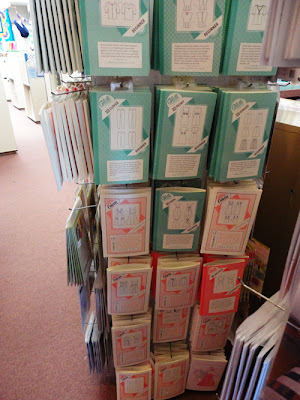 I was most interested in the table of patterns from Colette because I wanted to buy the newly released ones :) Oh, I'd like to give a shout out to Romy who found the last Juniper pattern for me. You made me so happy! Before I left my house I asked my husband if I would be lame if I brought my Colette Sewing Handbook for Sarai to sign. He told me that if he had a basketball that he would have Lebron James sign it. That settled it. When Sarai was signing my book I told her the story and informed her that she was my Lebron James haha. And if anyone is down for more sewing get together and meet ups, let me know! It was such a highlight of my "sewing life" to meet them :) And they were soooo nice too! Oh yay so happy for you! I have to live vicariously through you gals because I live in a little podunk town in Indiana. I also don't know anyone close by that sews so that was my main reason to start a blog, to share and be inspired by everyone! You look so cute in your pictures. Love that dress! I guess I should feel lucky that I have connected with so many people on the world wide web instead of being bummed that there aren't people physically nearby. This looked like such a fun get-together! I get the sense that those Colette ladies know how to have a shindig! I'm definitely still in the jealous boat - just living vicariously! Haha! 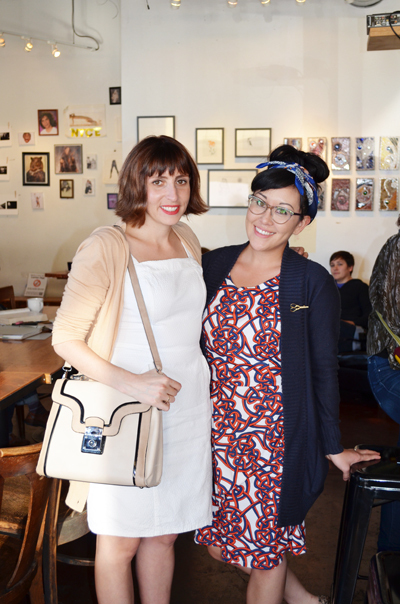 I am such a Sarai/ Colette fan girl. How jealous am I that you got to meet her! It looks like you had an awesome day. I do hope some sewists come out of the woodwork so you can meet up with them often. 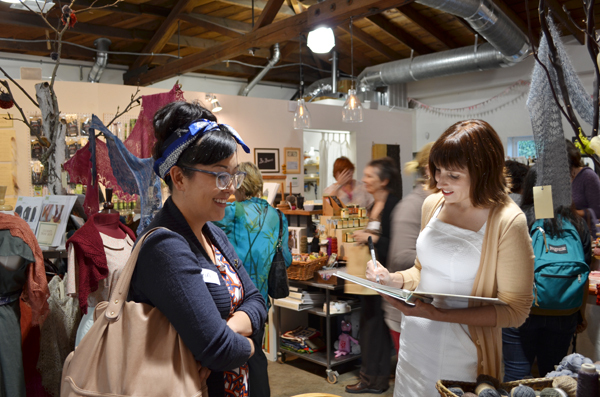 It's so nice to chat and trade sewing stories. Lolz to Lauren's comment!! ^^^ That's about what I was thinking too ;) So jealous!! You look adorable as always and it seems like you had such a great time! How could you not? I mean, that sounds like a pretty perfect day to me! Wish I could have been there too! Rochelle, I literally thought about you so much while we were shopping. I kept telling Qui that I wished you were here or that certain fabrics reminded me of you! Holy smokes, good post! I feel like a slacker--I have like two photos to use, lol. Maybe I'll write a post saying "to read about my trip, visit Erin's blog!" Next stop, New York!!!! Please, let's do this!! 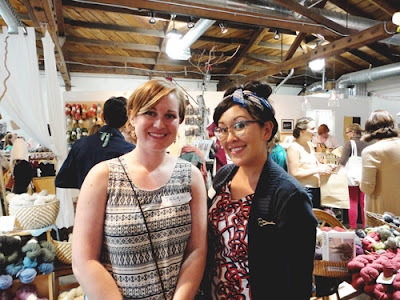 I'm so jealous that you got to meet Sarai, when I first started sewing Colette was one of the first blogs I found. I don't have any sewing buddies near me either. boo. But it looks like you found some new people! Hopefully I will get together with some of them again someday! Wow! What an amazing time!! I am SO JEALOUS!! It looked like such a fun evening! Thanks for the invitation - I wish I could have joined! I can't wait to see you make up the new patterns! I totally understand about work! We should get together sometime though! Oh wow, I'm so glad you got to meet Sarai and Ken (and Amy... and Qui... and Meg... sigh...)! DUDE... I'll come be a sewist in SLO the SECOND I can convince my hubs to leave NY! Love it there!!! It was great to meet you! Your dress was fabulous as well as your style. Glad you had fun and thank you so much for getting Sarai and Ken to the pre-party. What a wonderful surprise that was! Happy sewing! Sooo fun! I want to go to the one on Friday night in LA, but I don't think I can take off work. Just oozing jealousy! It looks like you had so much fun! Oh I'm so jealous! I've been so out of the loop! I saw that the meetup was in Oakland just too late. You were so close! Well hopefully now that I'm back, I can make it to another event in the next few months. 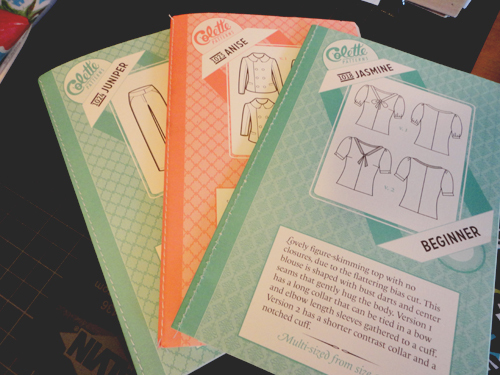 I can't wait till I can start sewing Colette's new patterns! Do you want to meet up at Hart's one day? Yes!!!!!! Let's go to Hart's! Please! 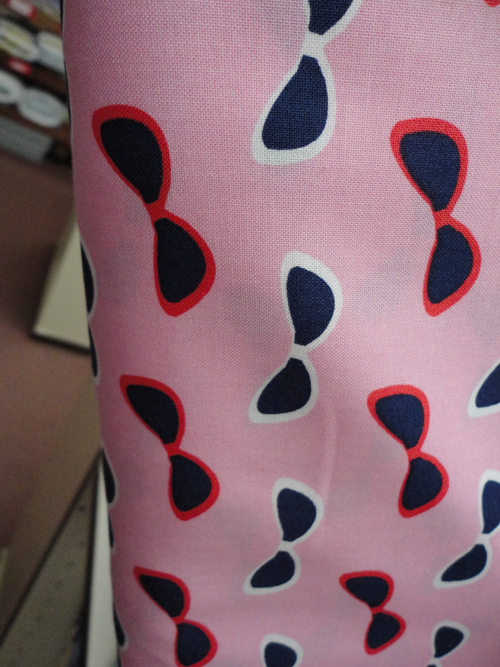 Maybe we should wait until I get the pants sewn up, so I can see you in my "Romy" pants (I just renamed them). You are so on! Now I have to sew something for the occasion also! Maybe my Violet, since I scored it at the same event? that store looks so cute!! And I want that soup and sandwich right now!